The gefilte patties, poached in tangy court bouillon. We finally hosted our first (and last) seders in Oregon…next year in Jerusalem (I mean Maine). 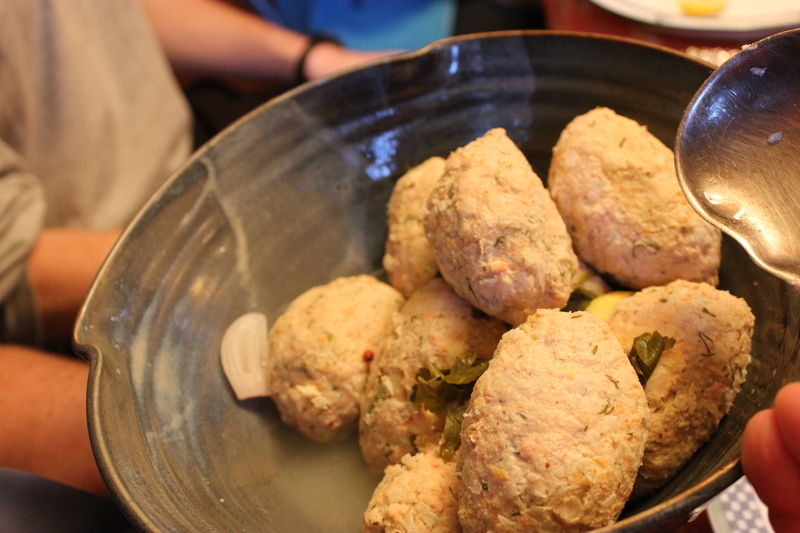 I never did learn to make gefilte fish from Dan’s Bubbe, who passed away when we were back East in January. I only grew up with the Manischevitz-jarred version, which my father relished doused with horseradish and chased with a tall glass of V8. (Note: this year, I concluded the all-natural Yehuda brand is superior to Manischevitz, which, gasp!, apparently contains MSG). 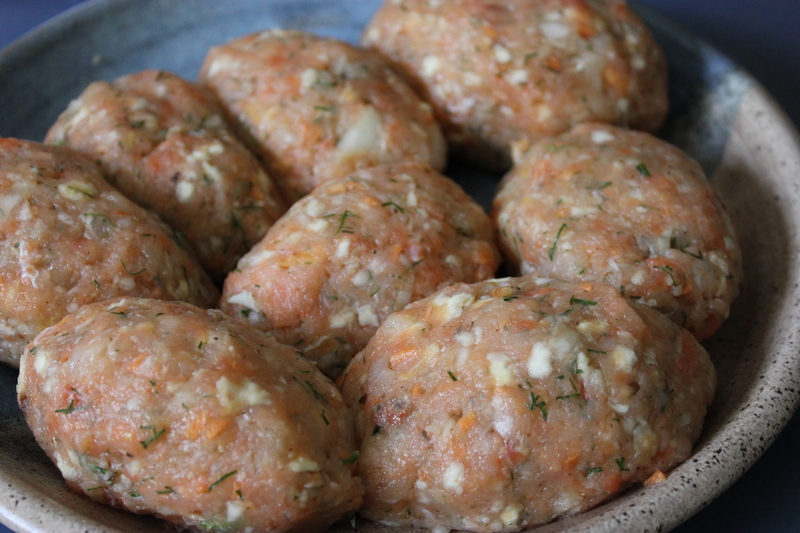 I never grew up with homemade gefilte fish. And after making it from scratch again this year, I’m not sure it’s worth the effort for the most (unfairly) reviled Passover food. This year, I poached homemade gefilte, in a tart court bouillon. The Pacific Northwest patties were made from salmon and haddock/cod (which I substituted for halibut). Perhaps I should have sprang for fresh Chinook over the frozen standard wild Alaskan Coho I got at Trader Joe’s. Somehow salmon doesn’t taste quite right in gefilte to my palate. But it looked pretty in the perfectly-shaped pink patties this year. The haddock/cod (or halibut) flavor is undetectable in the presence of salmon. Poaching didn’t add enough over the bake-in-muffin tins short-cut I’ve taken the past two years. If you want an easy way to prepare your own gefilte, this is one way to go. You could try any combination of fish in the following recipe. I would also keep the addition of lemon zest, chopped fennel frond and matzo meal (I thought all gefilte fish was made with matzo meal) from Jenn Louis’s recipe. 1. Preheat the oven to 350 degrees. Spray 24 standard muffin cups. (I don’t grease the pop-out silicone ones I use). 2. Place the onions in a food processor and pulse until they are minced. Transfer the onions to a very large bowl. 3. Process the carrots, celery, and parsley until ground. Add to the onions. 4. Process about two-thirds of the salmon, adding 1 piece at a time through the feed tube, until ground. Add the processed salmon to the onion mixture. 5. Process the remaining salmon, adding it through the feed tube. Then add the eggs, oil, sugar, salt, and pepper and process until well blended. Add this mixture to the onion-salmon mixture and combine well. Did not know that salmon was used in gefilte fish; thought it was usually carp, whitefish or pike. Our butcher makes really wonderful gefilte fish; even Jeff has decided he likes it now!